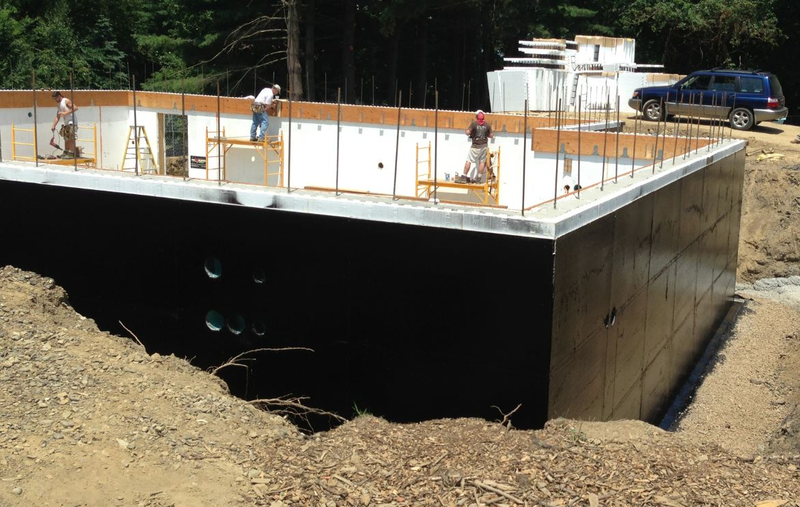 Contractors and architects striving to build durable, strong, and energy-efficient foundations should consider Fox Block insulated concrete form (ICF) over poured concrete foundations. ICF and poured concrete foundations both aim to support a building and resist lateral forces and buckling. However, a high-performing foundation must also seek to resist cracking, moisture intrusion, and heat flow. 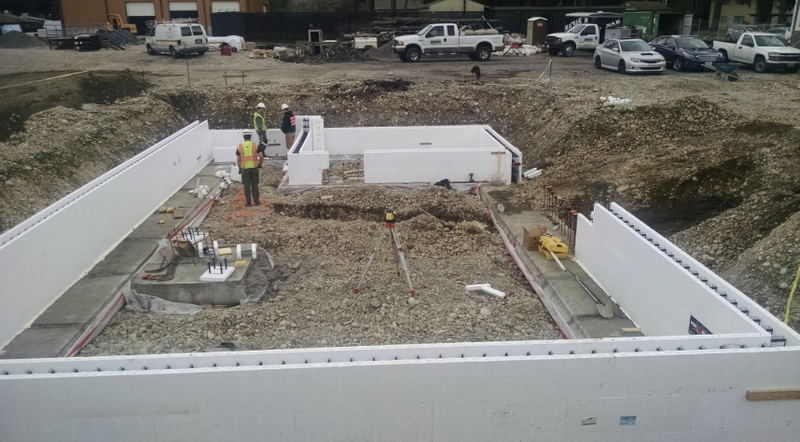 ICF foundations, like one built with Fox Blocks, more effectively resist heat flow, cracking, and moisture intrusion over poured concrete foundations. A strong foundation gives a building or home integrity against the forces of nature. It also ensures a safe place to live, work, etc. A foundation supports and anchors a building. It is also a water and soil vapor barrier. Importantly, a foundation is responsible for all the load transfers from the building to the ground. There are several foundations used in modern construction: crawlspace, slab on grade, and basement. 1. Crawlspace foundations support the entire structure and are similar to basement foundations, only they are more shallow – three to four feet deep. 2. 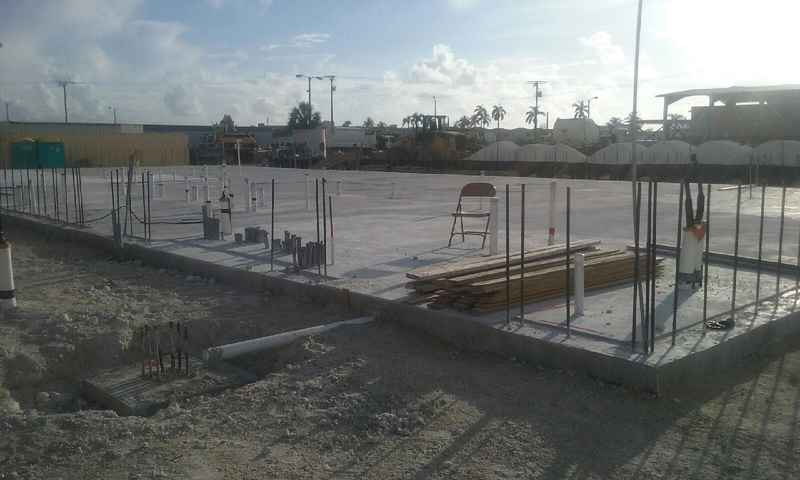 Slab foundation is a concrete slab, between four and eight inches thick. Slab foundation is the least expensive of the three foundations. 3. A basement foundation supports the entire structure. A basement foundation is a minimum of eight feet above the footings and provides living and storage space. Two materials used to construct foundations are ICF and poured concrete. ICFs provide durability and insulation for below-grade walls. Constructing ICF foundations involves dry-stacking expanded polystyrene foam panels, or interlocking hollow extruded polystyrene foam, to a foundation’s length. The forms are reinforced and braced. Workers then pour concrete into the hollow form panels. ICF foundation construction is a fast and simple method of building below-grade walls. – ICFs provide an excellent curing environment for concrete walls, resulting in a concrete foundation with about double the compressive strength of conventionally poured concrete foundation. – ICF foundations are disaster-resistant. For example, Fox Blocks, with steel reinforced concrete, are disaster-resistant and can withstand tornado and hurricane winds exceeding 200 mph, and projectile debris traveling over 100 mph. – ICF foundations incorporate continuous insulation and have few to no thermal bridges. – ICF foundations have built-in insulation values of greater than R-20. For example, foundations built with Fox Blocks exceed ASHRAE/ANSI 90.1 energy code requirements with an R-value of 23. – ICF walls are fire-resistant. For example, Fox Blocks have a fire-resistance rating (ASTM E119) of 4 hours for the 6-inch blocks and 2 hours for the 4-inch blocks. – ICF is termite resistant with an application of a product like Polyguard Products, Inc. 650 XTM or 650 XTP membranes. – The ambient temperature can be as cold as 5°F when pouring of concrete into the ICFs. Poured concrete foundations became popular in the 1980s. Constructing a poured concrete foundation involves placing forms on top of spread footings. Then steel rebar is placed between the forms. The last step is to pour concrete into the forms. 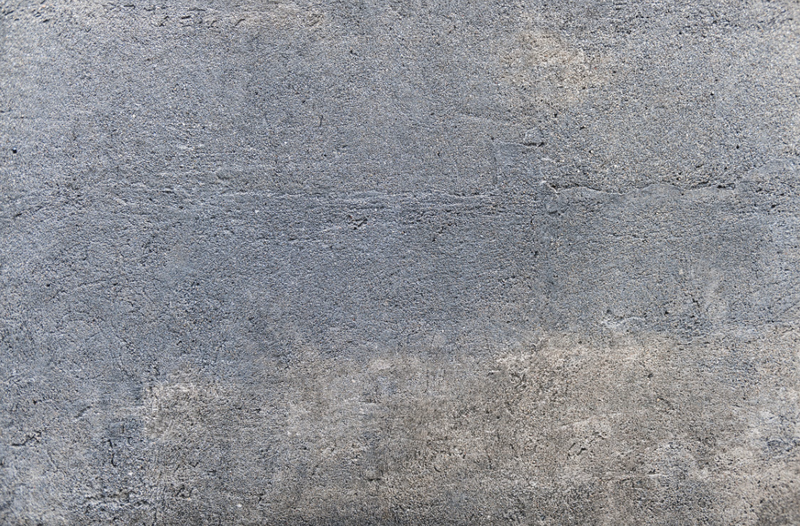 Poured concrete walls are 8-10 inches thick and available with surface patterns, like brick, which provides a finished appearance. 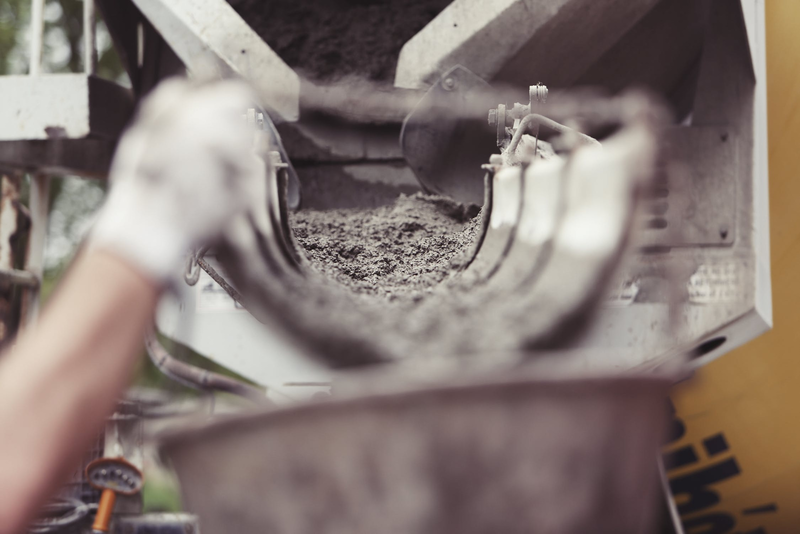 – Poured concrete foundations provide a high level of strength and durability and can last for decades. Also, poured walls have a compressive and flexural strength several times that of concrete block. – Poured concrete foundations are termite-resistant. – Poured wall concrete should not be poured in very cold weather. – If not prepared correctly, poured concrete can crack, which water can leak through. These cracks are often difficult to find and require the building owner to dig up all the concrete to find the source of leakage. – Poured concrete walls can leak moisture through non-structural cracks in the wall, where the floor and wall meet, at the top of the foundation wall or through the porous concrete. – Leaks may occur if the foundation drops, settles, or sinks due to the soil below the foundation collapsing. – Dry spots in the concrete wall can occur by improper grading or poorly planned outdoor construction. ICF foundations are more energy efficient, less prone to moisture intrusion, less sensitive to cold temperatures than poured concrete foundations. – ICF foundations have an R-value of greater than 20. Poured concrete foundations have R-values of less than 3. – Because the forms protect the concrete of ICF foundations, they are less susceptible to cracking and leaking than poured concrete foundations. – ICF foundations can be constructed most times of the year because it is not as sensitive to cold temperatures as poured concrete. – ICF foundations have the about double compressive strength of conventionally poured concrete foundations. Therefore there is less opportunity for moisture intrusion with ICF than poured concrete. – Poured concrete foundations are more prone to shifts in the ground and water pressure than ICF foundations. So, poured concrete foundations are more at risk of cracking and leaking, which can lead to mold and mildew growth. ICF and poured concrete foundations both strive to support a building and resist lateral forces and buckling. 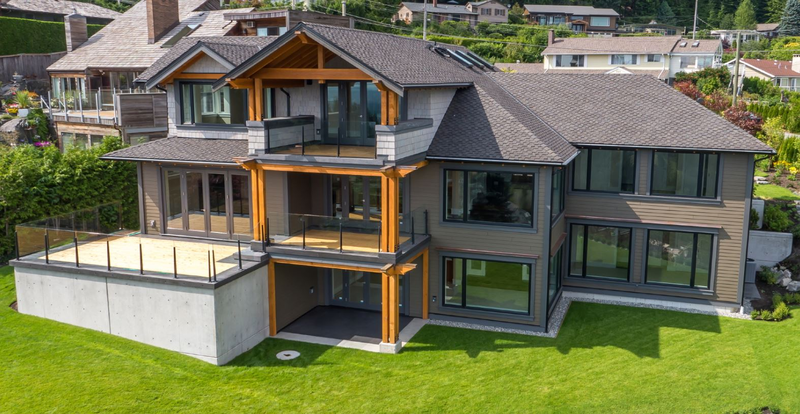 However, a high-performing ICF foundation, like one built with Fox Blocks, is more energy-efficient and resistant to cracking and moisture intrusion than poured concrete foundations. Builders and architects aiming to construct durable, healthy, and energy-efficient foundations should consider Fox Block ICF construction. 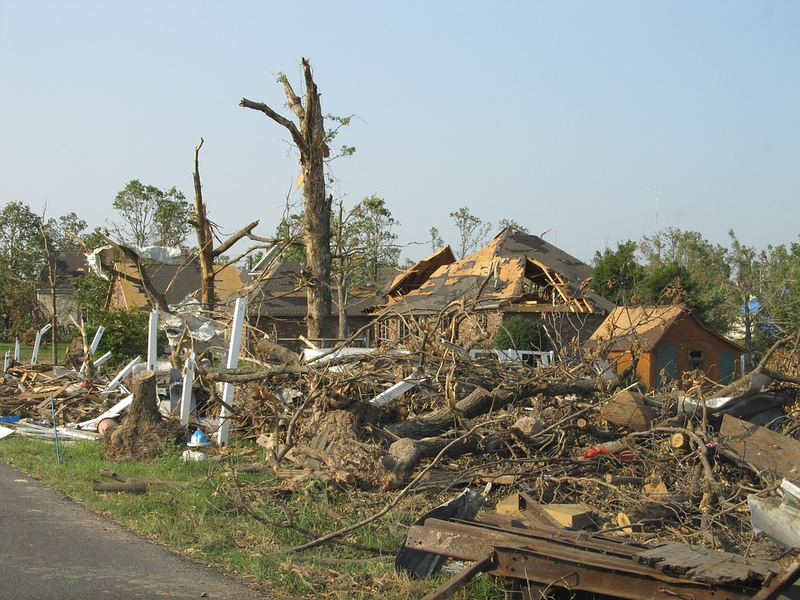 Tornado-resistant construction is critical in the United States where an average of 1253 costly and deadly tornadoes occur annually. In 2017 alone, tornado outbreaks cost billions of dollars and resulted in 34 fatalities. One of the deadliest tornadoes in 2017 happened in southern Georgia and killed 11 people. Building a tornado-resistant house with Fox Blocks can protect a home and family from disastrous outcomes during a tornado emergency. A proper tornado-resistant design protects a home’s integrity and its occupants. The design must take into account the strength of the entire house, provide a continuous load path, and be impact resistant. FEMA, however, still highly recommends a safe room, or tornado shelter, for maximum safety to a home’s occupants during a tornado emergency. When the severe winds of a tornado try to rip a house apart, a continuous load path is the best defense towards holding the home together. The continuous load path ensures that when a load, including uplift and lateral (horizontal) loads, attacks a home, the load will travel from the roof, wall, and other elements toward the foundation and into the ground. In addition, the integrity of the walls, roof, and floor are critical to ensuring a strong continuous load path that will hold the home together during a dangerous tornado. Homes built with insulated concrete forms (ICF), like Fox Blocks, maintain their integrity during the high winds of a tornado. Insulating concrete forms can withstand winds of over 200 mph. In fact, a study published by the Portland Cement Association (PCA) found that concrete walls have more structural capacity and stiffness to withstand the in-plane shear forces of high winds than wood or steel framed walls. Also, the strength of concrete walls produces less lateral twists and damage to the non-structural elements of a house such as the electrical wiring and plumbing. Utilizing Fox Block ICFs for tornado-resistant construction can maintain a home’s integrity during a strong tornado event. Flying debris is a threat during tornadoes and can damage the exterior of a home and injure its occupants. ICF walls are a best practice for tornado-resistant wall construction. In fact, a study by Texas Tech University found that ICF walls resist damage from flying debris traveling over 100 mph while conventionally framed walls failed to stop the penetration of airborne hazards. Insulated concrete form walls are the best protection from windblown debris to a home and its occupants during a tornado event. 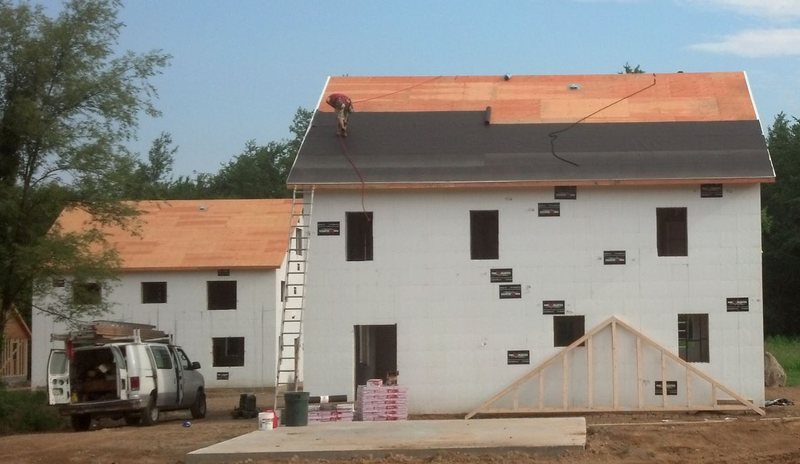 An ideal choice for tornado-resistant wall construction is Fox Block ICFs. Fox Blocks contain thermal and structural features within a single, reinforced concrete wall section. – Homes constructed with Fox Blocks maintain their integrity during intense tornado winds of over 200 mph. – Fox Blocks resist projectile debris traveling over 100 mph. – Fox Blocks also meet the thermal performance requirements of the IRC and IBC and exceed ASHRAE/ANSI 90.1 energy code requirements. The Fox Block Wall System has the strength to resist the heavy winds and flying debris of the most powerful tornadoes. 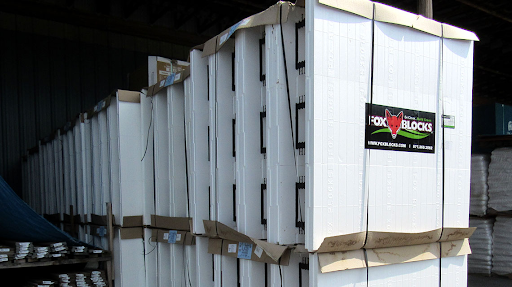 Fox Blocks ICF is an excellent material choice when building a tornado-resistant house. Building failures during tornado events often start with damage to the roof. First, the wind blows the shingles from the roof sheathing. Then, the roof sheathing rips from the roof framing. Finally, the roof framing pulls from the supporting walls. A tornado-resistant roof’s primary function in a continuous load path is as a horizontal diaphragm that moves the loads imposed by heavy winds to the supporting walls below. The roof sheathing is the first structural element in the load path between the roof system and the foundation. The sheathing works with the roof framing to transfer lateral loads to the home’s shear walls. Roof framing is the next building element of the load path. Sizing of the rafters of a roof’s frame must resist the weight of the roof system. The roof framing must also move the lateral loads to the shear walls below. It is essential in tornado-resistant roof design that the roof sheathing and framing are built and sized for the potential wind forces of the specific region. The floor system is the part of the continuous path that moves the loads to the shear walls in the stories below or the foundation. Floor framing often consists of dimensional lumber, or floor joists, spanning an open space. Floor joists must be sized to withstand the loads of the entire floor system along with vertical loads. The floor of a tornado-resistant home ensures the loads meet their final designation – the ground. A tornado-resistant design protects a home’s integrity and its occupants. Critical to tornado-resistant home design is a continuous load path, impact resistance, and strong roofs, walls, and floors. A safe room, or tornado shelter, is also highly recommended for the maximum safety of a home’s residents during a tornado emergency. An ideal product for today’s multi-purpose, energy-efficient, safe, and comfortable garages is Fox Block insulated concrete forms (ICFs). Today’s homeowners consider the garage an extension of their home, serving many purposes other than storing a car. Homeowners want garages designed with organized storage, a workshop, mother-in-law suite, and more. Like their houses, the garage must also include energy-efficient lighting, heating, and cooling features. Importantly, whether the garage is attached or detached from the house, homeowners want a secure garage that protects their expensive possessions, cars, and equipment from theft, fire, or natural disasters. Modern garages serve as annexes of the home; therefore, today’s garage should be energy-efficient and moisture-, disaster-, and fire-resistant. A garage built with ICF foundation and walls is energy-efficient because ICF provides continuous insulation across all structural members of the building’s envelope. Continuous insulation is essential to reducing air infiltration, preventing the flow of heat and energy, stopping thermal bridging, and increasing the effective R-value in a wall system. ICF is also a high thermal mass material, which helps stabilize temperature shifts within a garage by slowing the rate of heat transfer. ICF wall systems build energy-efficient garages. ICFs, like Fox Blocks, provide a solid continuous monolithic concrete wall with a perm rating of less than 1.0, which controls moisture intrusion. Moisture control is essential, particularly when the garage is used to store expensive equipment, family photos, etc. Moisture control also prohibits the growth of mold and mildew, which is unhealthy for the occupants of the garage. The moisture-resistance of ICF construction creates a healthy indoor environment for those working or living in the garage space. The moisture control of ICF construction also protects items stored in the space. ICF garages have stronger structural integrity against tornadoes, hurricanes, and other extreme weather events than steel- and wood-framed garages. In fact, a report by the Portland Cement Association (PCA) compared the structural load resistance of ICF walls to framed walls. The report concluded that concrete walls have greater structural capacity and stiffness to resist the in-plane shear forces of high wind than wood- and steel-framed walls. Furthermore, a study by Texas Tech University concluded that ICF walls resist the impact of wind-driven hazards, while framed walls didn’t stop the penetration of airborne debris. ICF construction creates disaster-resistant garages. Non-toxic fire retardant expanded polystyrene foam and steel-reinforced concrete are used to make ICF, which gives it a high fire rating. A high fire rating means that if a fire starts in the garage, it is better contained and less likely to spread to surrounding property than with a garage made of wood. 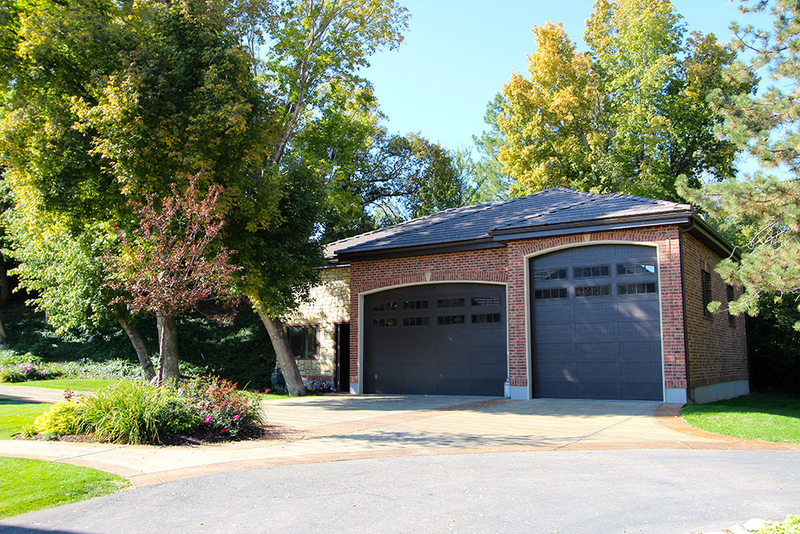 ICF construction creates a fire-resistant garage. The design flexibility of ICF creates functional and aesthetically pleasing garages with curves, arches, and intricate patterns. Whether the garage is only used to park a car or includes extra living space, ICF can accommodate all garage plans. ICF garages are also compatible with any finishing or siding products: stone, brick, wood or vinyl siding, plasters or plasterboards, etc., along with other non-structural building components like roofing, flooring, and utilities. ICF construction creates attractive and multifaceted garages. – Fox Blocks are a high thermal mass product that provides continuous insulation with an R-value of 23. Importantly, Fox Blocks exceeds ASHRAE/ANSI 90.1 energy code requirements, and create energy-efficient garages with exceptional energy performance. – Fox Blocks controls moisture intrusion. – Garages constructed with Fox Block insulated concrete forms (ICF) maintain their integrity during intense winds of over 200 mph, and projectile debris traveling over 100 MPH. – Fox Blocks have a fire-resistance rating (ASTM E119) of two hours for the four-inch blocks and four hours for the six-inch blocks. – For termite-resistance of an ICF wall system, Fox Blocks recommends an application of a waterproofing and a termite membrane like Polyguard Products, Inc. 650 XTM or 650 XTP membranes. These two products were assessed and approved by SBCCI PST and ES for waterproofing and a termite protection membrane for ICFs. For homeowners determined to protect their garage and the contents inside it, Fox Block ICF is an excellent material choice. ICFs also create an energy-efficient, disaster and moisture-resistant garage. Initial costs of ICF may reflect a slight increase to traditional wood-frame construction expenses, but ICF garages are more energy-efficient than wood-frame garages, which saves money over time. Please contact Fox Blocks for more information on ICF garage construction.